"You have to understand the nature of light." In my thesis I argue that the look of Hasse Ekman's films vary depending which cinematographer he worked with. The films he made together with masters such as Göran Strindberg and Sven Nykvist, and Gösta Roosling, are on a completely different level than the rest (which were often shot by Martin Bodin and Hilding Bladh). Ekman had an idea and a style, so you would not mistake a film by Ekman for a film by Bergman even if they would have the same cinematographer, but you will still be able to tell which of Ekman's films were shot by Strindberg and which were shot by Bladh for example. When it comes to artists in film I think cinematographers are among the most important, and it is a shame that they, like so many other contributors, are often neglected by critics and scholars. Once I heard about an essay written about Gordon Willis and Carlo di Palma's work with Woody Allen. I got very excited that somebody was considering their vital contributions and I said to the writer that I thought Willis could light a set better than most. She replied that she did not know anything about lighting. She did not even know that this is what cinematographers do. I struggled to keep a straight face... But this is often the case. If you are not somebody really famous like Sven Nykvist or Jack Cardiff you seldom get any light shone on you, even though you yourself spend most of your time lighting others. "Manipulating shadows and tonality is like writing music or a poem." One of the greatest of all cinematographers, John Alton, has written a book called Painting With Light and that is what they do. The work of a good cinematographer (or DP - director of photography) can elevate the quality of a film far above the level of the script and the direction. A cinematographer, much like a director or a writer, can put his or her own individual mark on a film. Alton is an example of this, but there are others too. To name one example, the films Billy Wilder made with John F. Seitz look different from the ones Wilder made with Charles Lang. The films shot by Seitz have a harsher look, more clearly defined contrasts between white and black then those Wilder and Lang did together. But then again, the films that Lang did with Henry Hathaway look very different from than ones he made with Wilder. "You are always a student, never a master. You have to keep moving forward." Different DPs have their own fields that they work within. William Wyler preferred to have his films shot with extraordinary depth of field so he liked to work with Gregg Toland, beginning in 1936, who was an expert on that. They made seven films together, pushing the medium as far as it would go, much like John Ford would do with Toland on The Long Voyage Home (1940) and to a lesser extent on The Grapes of Wrath (1940). The following year Toland also worked with Orson Welles on Citizen Kane (1941). When Wyler made The Heiress (1949) he was unhappy about having to work with Leo Tover instead, who was not as good as Toland. Speaking of Citizen Kane, it is worth pointing out that many innovations in film art have been made by cinematographers. One example is the above mentioned John F. Seitz, who took out 18 different patents during the course of his career. Another key innovator was James Wong Howe, the former boxer who became an ace cameraman. Among the things he is famous for his expressive use of deep focus on Transatlantic (William K. Howard 1931) and for using handheld cameras, while on roller skates, on Body and Soul (Robert Rossen 1947). Howe also wrote an article, The Cameraman Talks Back, because he was upset about the lack of recognition for his work, and that of his peers. The article also gives a good overview of what a cinematographer does. One of my favourites in Howe's oeuvre is Sweet Smell of Success (Alexander Mackendrick 1957), which looks absolutely fantastic. It too might have influenced the French New Wave, not least its scenes out on streets or in bars feels similar. There were two key cinematographers of the French New Wave, Henri Decaë and Raoul Coutard. Decaë had made documentaries and short films, and preferred to work outdoors with handheld cameras. That way of working he brought with him when he began shooting films first with Jean-Pierre Melville (such as Bob le flambeur (1956) and later as part of the French New Wave. The most famous example is probably The 400 Blows (Les quatre cents coups, François Truffaut 1959) but he also worked with Louis Malle and Claude Chabrol. But perhaps even more important was Coutard. He was cinematographer on films such as Breathless (A bout de souffle, Jean-Luc Godard 1960), Shoot the Piano Player (Tirez sur le pianiste, Truffaut 1960), Lola (Jacques Demy 1961) and Vivre sa vie (Godard 1961). Coutard and Godard worked together for several decades, and hence they are among the key couples in film history. Other important cinematographer/director relationships are Robert Burks and Alfred Hitchcock, Chris Doyle and Wong Kar-Wai, Agnes Godard and Claire Denis, Gunnar Fischer/Sven Nykvist and Ingmar Bergman and Billy Bitzer and D.W. Griffith. But some actors also form professional relationships with cinematographers, such as Greta Garbo with William H. Daniels (they did 22 films together and he clearly had a part in creating her aura and her fame). This has not been a technical post but you can talk at great length about lenses, the film speed, candela and such, but that can wait for another day. Today the aim was just to celebrate their work. All the quotes are from Conrad Hall, one of the great masters. He was a treasured legend among cinematographers, and active all the way up to his death, in 2003. His last film was also one of his best: Road to Perdition (Sam Mendes 2002). This post is based on one I wrote several years ago for my Swedish film blog. It has been slightly amended 2014-03-07. In 1939 Bosley Crowther reported in the New York Times that a debate was going on in the film community about whom should be considered the author of a film, was it the director, the writer, the producer or perhaps even actors? Crowther himself seemed to be undecided but it seemed the director was getting the upper hand. 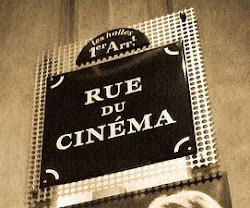 This is but one of many examples that disproves the popular and persistent idea that discussions about auteurs and authorship began in the 1950s in France, with the writings of Francois Truffaut, Jacques Rivette, Eric Rohmer, Jean-Luc Godard and others in Cahiers du cinéma, and that previously directors were not considered authors or artists. This has always been an a-historical misconception. To consider the director as the artist, the auteur, was common already from the very beginning of narrative films. D. W. Griffith was for a long time (mistakenly) considered "the father" of narrative cinema and this can be said to be an early example of the cult of the auteur. Griffith was actively using his own name as a brand, promoting his films as "D.W. Griffith's latest film". The poster of Intolerance (1916) has as its selling point that it was made by the same man who made The Birth of a Nation (1915). But it was not only Griffith, the poster for Ben-Hur: a Tale of the Christ (1925), despite being based on a famous novel and having famous actors, emphasised the fact that it was directed by Fred Niblo. The same was true in Sweden, where during the so-called Golden Age (roughly between 1913 and 1924), films were sold as the work of Sjöström, Stiller or af Klercker, or, as many of the films were based on novels and short stories by Selma Lagerlöf, were marketed as "Selma Lagerlöf's novel adapted and directed by Victor Sjöström". And it continued like this in the 1930s. Posters would emphasise the director, especially if it was somebody famous like in the US Ernst Lubitsch, Frank Capra and John Ford, in Britain Alfred Hitchcock and Anthony Asquith, in Sweden Gustaf Molander. Filmmakers that today are forgotten were also used as selling points. It was the same in trailers. So as far as the publicity department was concerned, in the US as well as Europe, it was the director's medium, from at least the mid-1910s. But the critics and the theorists were not treating the medium any differently. Early theorists such as Vachel Lindsay, Jean Epstein, Louis Delluc considered the director as an artist, the person whose soul could fill a film. The leading British critic Dilys Powell, already in the 1930s, argued that great films are made by great artists, and that a filmmaker's complete body of work can be discussed as a whole. She treated Jean Renoir, Alfred Hitchcock, Preston Sturges, René Clair, Marcel Carné, John Ford and many others this way. In 1946 she wrote about the national, industrial and cooperative aspects of cinema and then asked the rhetorical question: “How can one man leave the mark of his personality and his talent on this hugger-mugger?” and she answered “But he does.” She also wrote that the visual language of a great filmmaker is the equivalent of the written language by a novelist. In the US such famous critics as Manny Farber and James Agee also wrote of directors and their body of work as a whole. In Sweden there was a debate in 1940 about who the real artist was, the writer or the director, and most argued that it was the director, even when they did not themselves write the script, just as Dilys Powell felt. Leading Swedish critics such as Georg Svensson and Gerd Osten wrote about films and filmmakers in this way, Osten for example wrote an essay comparing the female characters in the films of Otto Preminger and Carl Th. Dreyer. So when Truffaut and the others burst on to the scene in the mid-1950s they did not bring anything new to the table, there was a long and widespread history of auteur-thinking and auteur-writings. The major importance was that they now discussed a much wider range of filmmakers. Whereas earlier it had been a more selected group, such as Fritz Lang, Capra, Renoir, Hitchcock and Ford, now everybody was a potential auteur. Even though less prestigious directors had been championed before (Gerd Osten was particularly favourable towards Robert Siodmak), there was now much more of that. Joseph H. Lewis and Nicholas Ray were considered on par with Robert Bresson and that now started to become much more common. Or put another way, the critics of Cahiers du cinema did not change the way great films were discussed, as the work of great directors, they just considered more films and more directors to be great than had previously been the case. Andrew Sarris in the US and the critics at Movie in the UK also helped with this levelling of the playing field. So the idea of director as the star and as the auteur has been with us since the early days of cinema and has never really gone away, and will probably be with us for some time still. As somebody who is very much interested in aesthetics and style, perhaps more so than story, I am conscious of the importance of the cinematographer in the making of a film. Therefore my next post will be about them and their work. 2013-10-30, some spelling mistakes have been amended. If you are sitting at home watching an episode of Frasier (1993-2004) on your flatscreen TV it is reasonable to assume that if somebody asked you what you were doing you would answer "I'm watching TV." Let's say that next in the TV schedule came the film She's the One (Ed Burns 1996), and you continued to watch that. If somebody now asked you what you were doing you might still answer "I'm watching TV." or "I'm watching a film." But imagine instead that you had not being using your TV at all, you might not even have one, but found She's the One on BBC iPlayer and watched it on your computer. If somebody asked you now what you were doing you would in all likelihood not answer "I'm watching TV." Probably not even if you were watching Frasier, despite it being a TV-series. You would not say "I'm watching the computer." either. You would say "I'm watching Fraiser." and potentially add, "on the computer." to clarify. Now, what is the point of this example? To illustrate that TV is loose term. It can mean the square box in the living room, it can mean all the things that are being shown on that square box, and it can mean a typical kind of moving images. But what they all have in common is that box. If nobody watches anything on a particular device called a TV, if instead all that is being watched is watched on computers or smartphones, then TV will cease to be, and we would no longer call a follow-up to Frasier a TV-series, but something else. Maybe just a series. To some extent, TV is just the tableau in the newspaper or the TV Guide. This is not just hair-splitting, it raises some interesting questions. Today it is very popular to say that this is the golden age of TV, that TV has never been more important or better. I have never understood this, and it is very tempting to dismiss it as confused hogwash. The way I see it there are two flaws with the argument. One being that those making the argument are often depressingly ignorant of the last 60 years of TV history (see below). The other flaw is that you compare wildly different things. TV today, as has pretty much been the case since its inception, consists of news, documentaries, sports, soap operas, weather forecasts, movies, sitcoms, children's programmes and so on. In effect, this means that in order to say that TV is better today you would have to explain, for example, how children's programmes today is better than documentaries about nuclear waste from the late 1970s. If TV today is better than ever before, does this mean that Jersey Shore (2009-) is better than Scenes From a Marriage (Scener ur ett äktenskap Ingmar Bergman 1973)? It was a silly question yes, but so is the argument. But what people mean in general when they say that TV is better now is only that TV-series are better now. The problem here though is still one of comparisons. First of all, how many TV-series of yesteryears have today's writers actually seen? Secondly, there are a wide variety of TV-series being made, in different genres, and comparing them might be strange. It makes little sense to compare a series like The West Wing (1999-2006) with a show like Kojak (1973-1978) for example. But it would make sense to compare CSI (all of them, 2000-) with Kojak. Which one is the better one would be hard to argue about though, because although CSI is more modern, style-wise, that is not a sign of quality. If it was that would also seem to suggest that, say, This Means War (McG 2012) is automatically a better film than, say, The Grapes of Wrath (John Ford 1940). So, considering that TV is so much more than just TV-series, and that TV has a long and rich history, I do not think it makes any sense to say that TV is better than it has ever been. However, I think it does make sense to argue that TV is coming to an end, and that one sign of this is that when people talk about this being a "golden age" of TV they do not really mean TV but HBO (and a few other studios). Maybe this is actually a golden age for a studio system while simultaneously being the demise of TV. Since these TV-series are often watched on DVD box sets or downloaded on to a computer they might even help accelerate the fall of TV. I would actually suggest that TV today, in general, is worse than it has been for quite some time. If you turn on the TV on any given day or night, chances are that you will only be able to chose between some game shows, some reality soaps, some talking heads shows and some sport events, regardless of how many channels you have got. If you want to see the good stuff you would not just turn on your TV but only together with your DVD-player, or just your computer. There are many brilliant TV-series today, and some of them are among the best things ever done for TV. But today's TV-series do owe a lot to what came before. A key series is Hill Street Blues, which ran from 1981 to 1987. It had complex characters, it was set in the real, and very gritty, world of an American city, it was unpredictable and it was filled with political themes, it discussed topical issues and it had outbursts of anger and bitterness. It was followed by a number of other law and order shows, especially NYPD Blue (1993-2005), which style of filming has been a major influence on the likes of Lars von Trier. These shows were in contrast, in style, quality and ideology, to the more soapy series such as Dallas (1978-1991), Dynasty (1981-1991) and Falcon Crest (1981-1990), even though they were also influential and had sometimes baffling complexity. A TV-series which was somewhat in-between, but closer to the cop thrillers than the soap operas in its honesty, was L.A. Law (1986-1994). It is worth pointing out that Steven Bochco was co-writer, co-producer and creator of Hill Street Blues (together with Michael Kozoll, and David Milch as co-writer), NYPD Blue (together with David Milch) and L.A. Law (together with Terry Louise Fischer, and David E. Kelley as co-writer). If we look further, it is clear that in the late 1950s and early 1960s, American TV had an extraordinary period, when for example Arthur Penn, John Frankenheimer, Sidney Lumet and Don Siegel made made-for-TV films and live TV-shows, and film was very much influenced by TV. Some of these TV-films were considered so good, or so violent in the case of Siegel, that they were given a cinema release, such as The Killers (1964). That was just the obvious ones, but there are a number of other series which also have considerable qualities and have been very influential. In addition, so far my examples have been American TV. There are many other TV-producing countries. In the 1970s British and Swedish TV was very exciting, and it continued to be so into the 1980s at least. In the 1970s for example many of Sweden's best filmmakers made TV-series and films directly for TV, including Bergman and Jan Troell. But still, something has changed in recent years. One thing is obviously HBO (Home Box Offfice) which have managed to produce one fantastic series after another since 1998. (HBO was around before that but beginning with Oz (1997-2003) they entered into a new phase of making high-quality series). Another thing is the status of TV. In the 1980s and early 1990s TV was a place for TV-only stars, or new faces or retiring movie stars, but if you were a proper movie star you would not be in a TV-series, it was undignified. But that eventually changes so that, to take one example, in the second season of Friends (1994-2004) big movie stars were lining up for a guest part, such as Julia Roberts and Brad Pitt. But that does of course not make TV better, only its hip factor higher.